It’s a recipe that has its own logic: you start by rendering bacon. Then you cook them down with some sugar and salt for about 30 minutes. 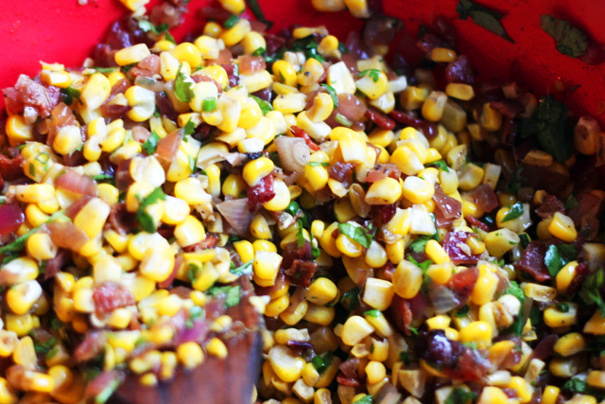 The idea is that you’re creating a sour component that’ll complement the sweet summer corn and the meaty/salty bacon. Then I took my largest non-stick skillet, added a glug of olive oil, heated it, and then added all of the corn with a big pinch of salt, stirring a bit until the corn was just cooked. 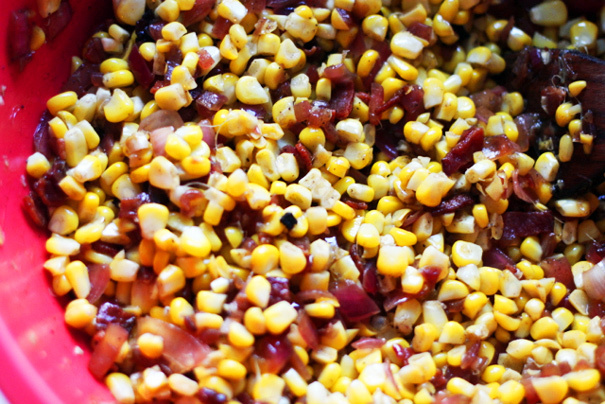 To finish, you dump the cooked corn into a big bowl and add the bacon and the balsamic onions. Stir that in and there you are, a killer summer side dish that I served with my famous spicy spatchcocked chicken. It’s a side dish so good, you can’t possibly make too much. I ate more than two helpings and nearly fought over the rest. 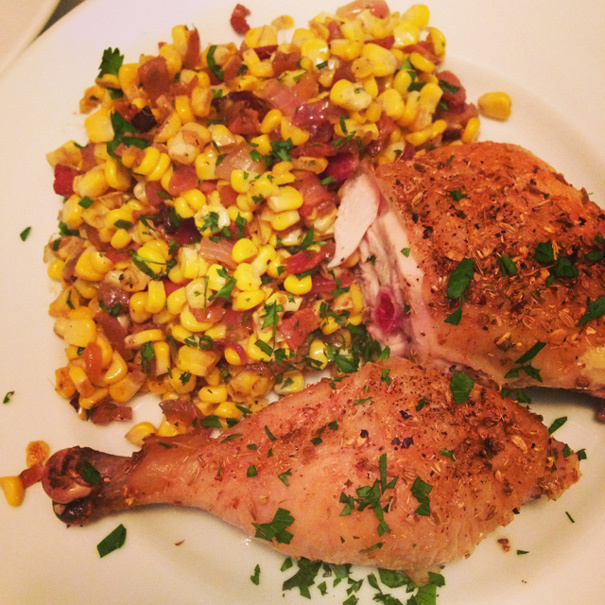 Again: it has the sweetness of summer corn, the salty/meatiness of bacon, and the zippy tang of balsamic-infused onions. Why are you not rushing to the store to make this right now? If there’s a run on corn at your local grocery store, now you’ll know why. Summary: Based on a recipe from Food52.com. Start by rendering the bacon in a large skillet with that splash of neutral oil–which helps the bacon start going–until most of the fat has come out and the bacon is crisp. 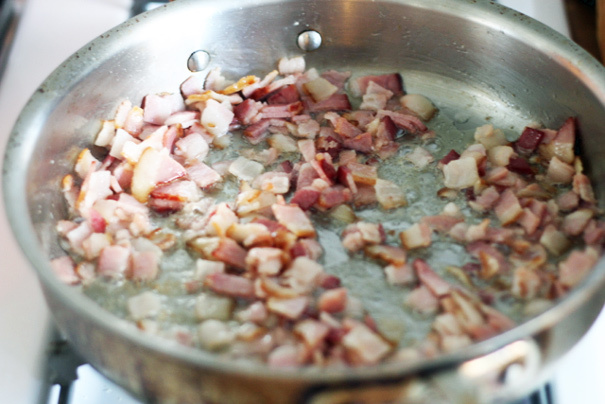 Lift the bacon to a paper-towel lined plate and pour out some of the bacon fat, leaving about 2 tablespoons. 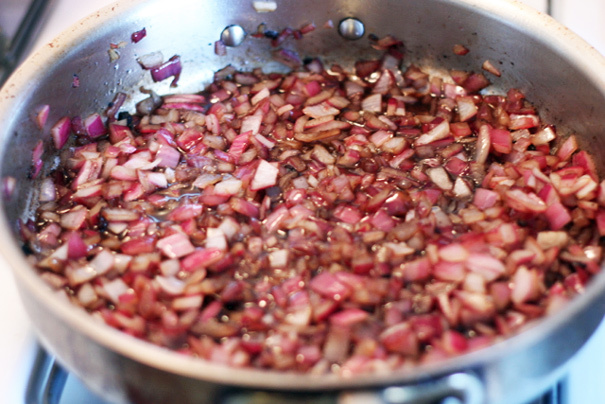 Add 2 tablespoons of olive oil and the red onion. Saute with a pinch of salt for a minute, then add the balsamic vinegar, sugar, a pinch of salt and some pepper. Bring to a boil, scrape up the brown bits on the bottom of the pan, then lower to a simmer and cook for 20 to 25 minutes until most of the liquid has evaporated. 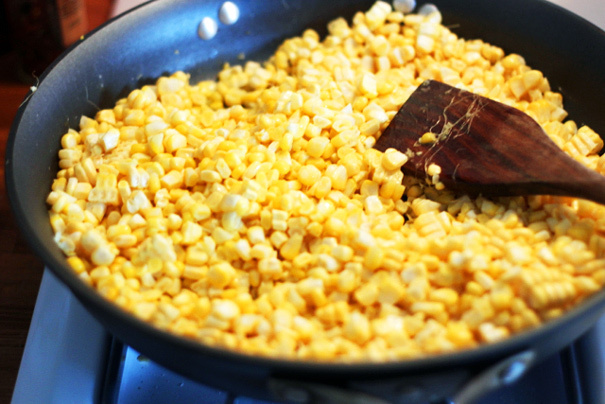 Heat a large non-stick skillet with the remaining 2 tablespoon of olive oil; then add all of the corn kernels and a big pinch of salt, tossing and stirring until the kernels are just cooked through, about 3 to 4 minutes. 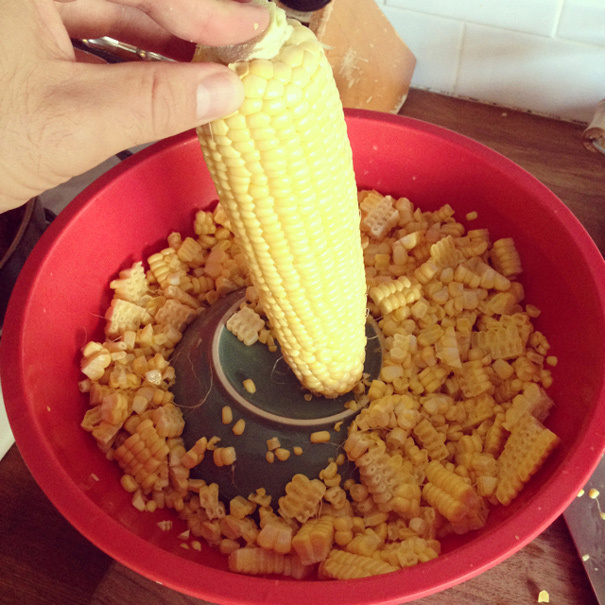 Pour the cooked corn into a large bowl. 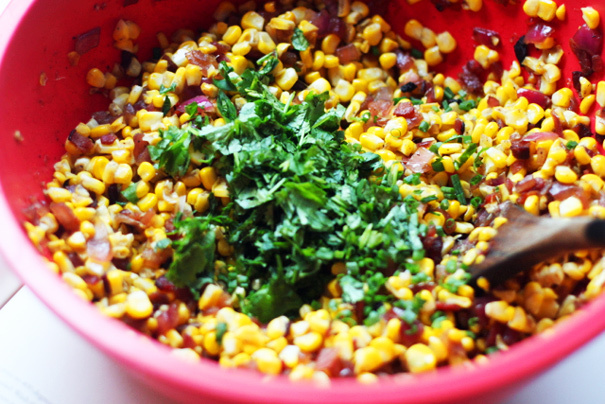 To finish, stir the corn together with the reserved bacon, the balsamic onions, and the finely chopped cilantro. Serve warm or at room temperature. This chicken chili is pretty good.